Welcome to ’70 Voices: Victims, Perpetrators, Bystanders’ from the Holocaust Educational Trust. Over the next 12 weeks we will explore different elements of the Holocaust through poems, diaries and writings from those at the centre of it: the victims, survivors, perpetrators, and other witnesses, in the hope that they can enable us to better comprehend this most challenging episode in history. View new content here each day on the homepage. 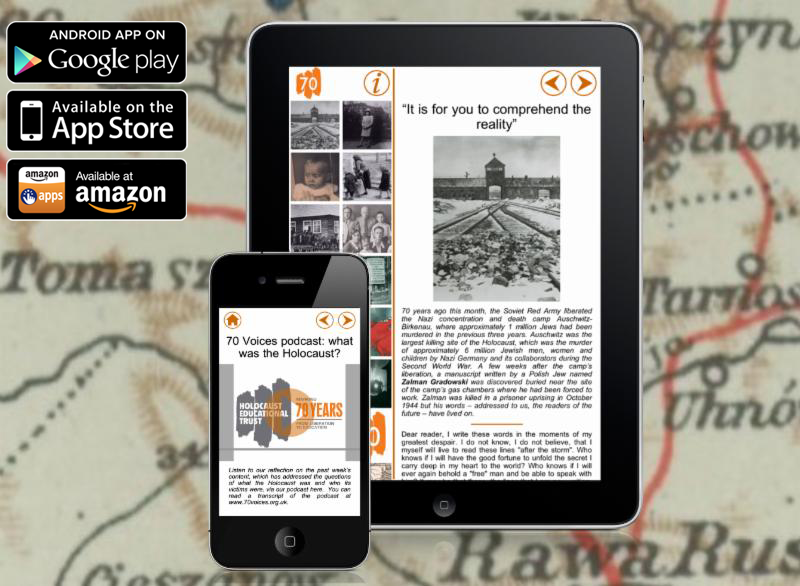 "IT IS FOR YOU TO COMPREHEND THE REALITY"
"I WANT TO GO ON LIVING EVEN AFTER MY DEATH"
"I SAW THEM DISAPPEAR INTO THE DISTANCE"
"ONCE, THERE WAS A GARDEN"
"MY DREAM HAS COME TRUE"
70 VOICES PODCAST: WHAT WAS THE HOLOCAUST? "THE WORLD WILL LEARN TO UNDERSTAND US"
"THE GERMAN STANDS, THE JEW COWERS!" "A SIGHT THAT CHILLED OUR BLOOD"
"LIFE AS I HAD KNOWN IT, STOPPED"
"TODAY I WILL ONCE MORE BE A PROPHET"
"ALL JEWS OUT OF EUROPE"
"AN IMMEDIATE SHORTAGE OF BREAD"
"THE AIM OF SOLVING THE JEWISH QUESTION IN LITHUANIA HAS BEEN ACHIEVED"
"WE MUST ANNIHILATE THE JEWS, WHEREVER WE FIND THEM"
"EUROPE WILL BE COMBED FROM WEST TO EAST"
"YOU REMEMBER THAT HUMAN BEINGS LIVE IN THIS GLOOM"
"HERE, IN THE GHETTO, IT'S CHEERLESS AND BLEAK"
"I WANT TO SEE MY HOME ONCE MORE"
"THE WORRY OVER WHAT TOMORROW WILL BRING"
"WHAT WILL HAPPEN TO HIM? WHAT WILL THEY DO WITH HIM?" "UNABLE TO BEAR THE SUSPENDED HORROR ANY MORE"